between ages 16-23, must obtain 12 credits/CEUs (2 days) every 4 seasons. between ages 24-64, must obtain 12 credits/CEUs (2 days) every 2 seasons. between ages 65-74, must obtain 12 credits/CEUs (2 days) every 3 seasons. 75 years and older, must obtain 12 credits/CEUs (2 days) every 4 seasons. What if my schedule did not permit and I was unable to participate in my update in the season I was due? If you are not actively teaching and/or have been unable to ski/ride, but wish to remain a member, inactive status is an option. The inactive status form is available by clicking here. If you fail to maintain these requirements and wish to reinstate at a later date, you would need to go through the reinstatement process. You can obtain certification pins and educational materials through the PSIA-E/AASI office in Albany, NY. We ask you to fax or mail us an order form with your credit card payment information. Educational materials are also available through the Accessories Catalog from the national PSIA/AASI office. Where can I access the exam guides? Click for the Alpine Education section. Click for the AASI/Snowboard Education section. Click for the Adaptive Education section. Click for the Nordic Education section. When is the course/event schedule posted for the season? We publish the fall course schedule and early-season event dates in the Summer Snow Pro. The full season event schedule is published in the Early Fall & Fall Snow Pro and is usually posted on our website by the first week of September. You can click here for the EVENT SCHEDULE page. Online registration is available for most events! You can click here to go to the EVENTS SCHEDULE page, which has links to register online. Exams and some other select events are not eligible for online registration. The event application form is available in most Snow Pro newsletters, or online – click here. You can fax the form with your credit card information to (518) 452-6099, or you can mail the form, with your payment. The event application and payment must be received in the office by the deadline to avoid a late fee of $25. Applications cannot be processed without payment, and are considered late if separate payment arrives after the deadline. How is the application process for the Snow Pro Jam event different? Because of its popularity and limited size, Alpine Snow Pro Jam & Master’s Academy registration is done differently from other events on our schedule. Complete details on the Snow Pro Jam and how to register are always outlined in the Summer Snow Pro, or click on this link. NEW – Online registration is available on the day registration opens! If you wish to mail or fax your application, please use the specific Snow Pro Jam registration form. If you have any questions about the process, be sure to contact the office prior to sending your application. How do I know if my event application was received and I am registered? We e-mail confirmations to all members who register for an event. You are welcome to give us a call in the office to confirm that your application has been received. During the very busy season, please give us 24-48 hours before calling as we do try to process applications within that time frame. If it’s the deadline day, you can certainly call us and we will check. Other than that, waiting that day will make it easier for us to confirm your registration. Thanks for your understanding and assistance. What are some of the administrative charges I should be aware of? Please see this page for a summary of the fees and administrative charges you should be aware of in our event registration policies, and some other notes from the Eastern Office. What is the age at which an instructor can become a member? You can become a Registered Member of PSIA-AASI Eastern Division when you are 15 years old or older. You can become a Certified Member of PSIA-AASI Eastern Division when you are 16 years old or older. Membership renewal statements are mailed annually in May, and must be renewed by June 30th to avoid a late fee. The rate will vary based on your membership type. If you become a Registered or Certified member, you pay both divisional and national dues in order to participate in all of the programs and benefits of both organizations. 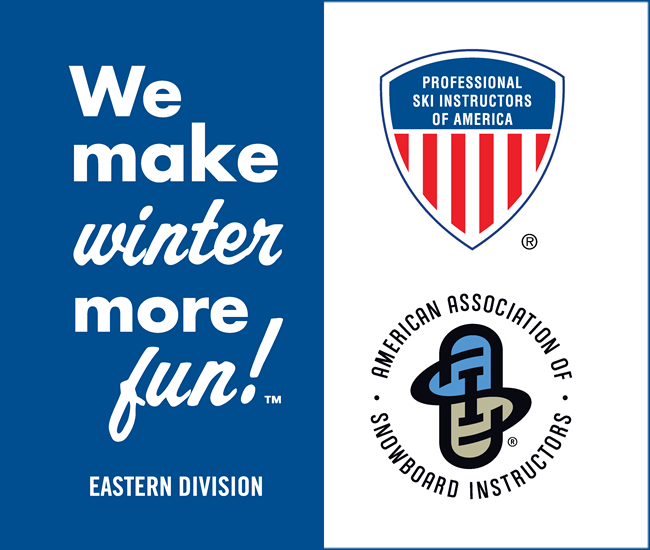 For the 18/19 season; $59-69 of your dues goes to the National PSIA/AASI organization, while $50-72 goes to support our Eastern office and programs. We also have student, inactive and senior rates available. What is the reciprocity offered for USSA Members? All USSA Coaches Level 100 or higher may join PSIA Eastern Division as Alpine Level I Certified Members. In addition, USSA Coaches can attempt any certification exam up to their current level. For example, a Level 300 USSA Coach may attempt the Alpine Level II Exam or the Alpine Level III Exam. Any skiing performance area or teaching module which they have successfully attained, may be banked for life, based on continuous membership. USSA Coaches would be required to fulfill all required prerequisites prior to an exam attempt. If unsuccessful at the exam attempt, the USSA Coach would remain a PSIA Level I Member. If you have any questions regarding this reciprocity or event requirements, please feel free to call or e-mail the office. What if I join half way through the season? Our current system does not allow us to prorate dues on a daily basis, but we do our best to accommodate our members by extending membership for any member joining us after a certain date in the season (as noted on the new member application). What is the student membership rate, and what are the requirements? Eastern Division members, age 16-23, will receive a discount of $20 off of the Eastern portion of dues and $10 off the National portion of dues. Verification is no longer required. Eastern Division members, age 24-29 will receive a discount of $20 off of the Eastern portion of dues. Certified Members, age 16-23, must obtain 12 credits/CEUs (2 days) every 4 seasons. If you have any questions regarding your renewal rate or your event requirements, please feel free to call or e-mail the office. What is the senior membership rate, and what are the requirements? At age 70 or older, member are given a discount of $20 off of the Eastern portion of your membership renewal. These deductions will automatically be made on your membership renewal. At age 75 or older, member are given a discount of $20 off of the Eastern portion of your membership renewal and $10 off the National portion of your membership renewal. These deductions will automatically be made on your membership renewal. The reinstatement process was set up to provide former members a path to return to active membership without loss of their prior certification level. If you were a member of PSIA-E/AASI in the past, and are interested in reinstating with us, please fill out the Reinstatement Request Form or fax or e-mail that information to the PSIA-E/AASI office. I just passed an exam, but I don’t see my new certification on my record. Why is that? We process exam events back into the database ASAP when we have received all of the information from the event back in the office. Sometimes that can take time to get the paperwork. Your record should reflect your new status once we process the paperwork back into the system. If you still do not see your new certification within a reasonable time (a few weeks), or if there is some urgency to access a program and this delay is causing difficulty, please call us in the PSIA-E/AASI office and we will try to assist. What are the requirements to be an Inactive member? A member who would like to renew as inactive must sign an affidavit that they are not actively teaching snowsports for the entire season. Inactive members are exempt from attending clinic updates while they are inactive, although it is recommended to continue to attend clinics to make it easier to return to active status. What is the policy for taking exams in another division? Eastern Division members may take an exam in another division if they are working and currently residing in that division. Eastern Division members must provide written confirmation of employment and permission to take the exam from the Ski School Director for whom they are currently employed. This documentation and a letter explaining the request must be provided to the PSIA-E/AASI office prior to registering or taking an exam, and at least 3 weeks prior to the exam date. If the request is approved, the Eastern Division will then e-mail approval to the exam hosting division. It is not necessary for a Eastern Division member to transfer to or maintain dual-membership with the division hosting the exam. If the format of the exam in the other division requires passing more than 1 part to become certified at the desired level, the entire exam must be passed in that one division. No part of an exam may be counted toward the exam process in Eastern Division or any other division should you return or relocate. If the candidate has attained a new certification level, the hosting division will issue the appropriate pin and certificate to the member. If you would like more information, please call the office at (518) 452-6095, or e-mail for more details. Will any event fulfill the continuing educational credit requirements? Even in another discipline? Yes, any two day (minimum) clinic will fulfill the continuing education credit (CEU) requirement, even a cross-over into another discipline. Actually, that’s a fun way to try something new and get your credits in as well! As an active member, you will have an educational delinquency fee ($50 for the first season overdue, or $75 for the second season overdue) billed on your next membership renewal if you do not obtain your continuing education credit in the season you are due. There’s nothing you need to notify us of in this case, because this is an automatic waiver built into your active membership, and basically gives you an extension to do your clinic next season. An educational waiver can be used for a maximum of two seasons. If you will not be teaching at all this season, you can consider Inactive status. Please take a look the information on the Inactive form at: www.psia-e.org/ms/faqs/what-are-the-requirements-to-be-an-inactive-member. If you would like to go to Inactive status, you will need to fill out the form and return that to us. If you are going to be teaching this season, you are not eligible to become an Inactive member. If you have any other questions, feel free to reply or give us a call. As an active Certified member, if you do not obtain your continuing education credit in the season you are due, you will have an educational delinquency fee ($50 for the first season overdue, or $75 for the second season overdue) billed on your next membership renewal. If you are not able to physically attend an event for a medical reason in the season that you are due, please submit a request for a medical waiver by having your doctor write a note stating that you are unable to fulfill your on-snow requirements in this season and why, and send that to us via fax at (518) 452-6099, or mail/e-mail (psia-e@psia-e.org). We will then grant you a medical waiver for that season, and you would not be charged the delinquency fee on the next membership renewal. You would then be required to take your event the following season to maintain your active membership status. Can I take an exam in another PSIA/AASI division? Eastern members may take an exam in another division if they are working and residing in that division. PSIA-E/AASI members must provide written confirmation of employment and permission to take the exam from the Ski School Director for whom they are currently employed. This documentation and a letter of request must be provided to the PSIA-E/AASI office prior to registering or taking an exam, and at least 3 weeks prior. If the request is approved, the Eastern Division will then provide written approval to the exam hosting division. It is not necessary for a PSIA-E/AASI member to transfer to or maintain dual-membership with the division hosting the exam. The entire exam (all parts, including any prerequisites required in that division) must be passed in ONE division. No part of any exam may be counted toward the exam process in PSIA-E/AASI or vice versa should you return or relocate. Exam results are passed on to the PSIA-E/AASI division office from the testing division as soon as possible (generally within a few weeks). After receipt of the results, the Eastern office will record the pass/fail results as well as the new level, if appropriate. If the candidate has attained a new certification level, the hosting division will issue the appropriate pin and certificate to the member. Can I attend non-exam events in another PSIA/AASI division? Yes, you can attend educational events in other divisions. Educational events held by another division will count toward your continuing education requirement. Please make sure you are doing enough days/hours to fulfill you requirement. There are specific requirements to request to take an exam in another division. Please ask the other division to send us official notification after the event, so that you are given credit for attendance. To be sure, you may follow up at the end of the season with the Eastern office to confirm that we have your event attendance posted as educational credit on your record. In order to get credit for a non-PSIA/AASI event, we require a written request for approval of the event in advance. The request must provide us with details of what the event will entail and its duration. Eastern members may only attend one non-PSIA clinic for credit every 4 years. How long must I wait before attempting my Level II certification? The Alpine discipline no longer has a requirement that you be in your 2nd season of membership to begin the Level II Exam process, or in your 3rd season to attend a Level II Teaching Exam. Please keep in mind that a prerequisite is valid for the season you take it and the following season. What are the prerequisites for Level II or III exams? Click on this link for Alpine prerequisites. Click on this link for AASI prerequisites. Click on this link for Nordic prerequisites. Currently, there are no prerequisite requirements for Adaptive exams.